On Memorial Day my wife and I headed out to search the countryside for interesting barns or other scenes to photograph. We stumbled across a beautiful Memorial Day display at the cemetery in Benton, Ks., which I posted an image of on Monday. We did find a barn, but the sky was not particularly interesting. We ended up eating a little picnic lunch at Lake Afton, which is a few miles from Wichita. 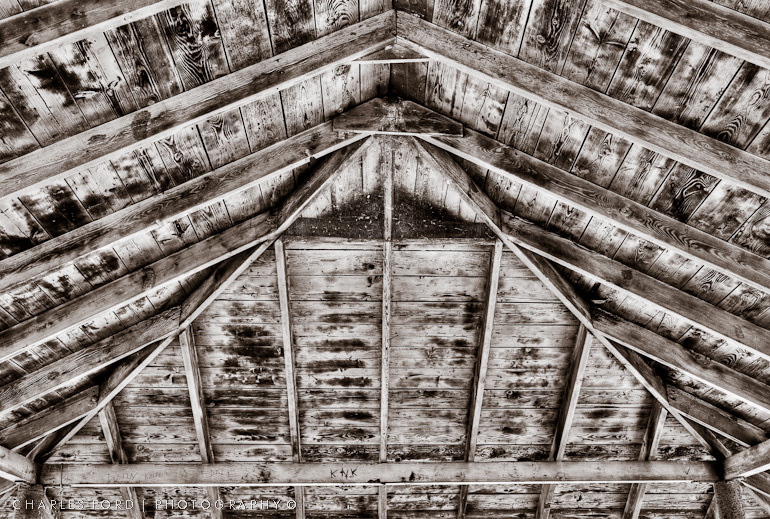 As I looked up at the underside of the wooden shelter we were under, I thought…wow that looks kind of interesting. I took a bracketed set, put it through Photomatix, then back into Lightroom for level tweaks and a monochrome conversion. A totally unexpected subject, and turned out to be one of my favorites of our little trip. Fate, or a higher power guided my wife and I to a beautiful Memorial Day display at the cemetery in the small town of Benton, Kansas today. When I saw the cross shaped flare coming through the flag on this image, I figured it might be more than luck. I hope everyone has a fun and safe holiday. Thank you to all who have served and sacrificed to defend our freedom. I learned a couple of things last Saturday. 1. When running around in a storm, it might be a good idea to check the front of the lens for water droplets before shooting. 2. Hail is cold when striking the body. Usually when there is threatening weather, you will find yours truly at home, where all good citizens are supposed to go when the skies turn angry. Last Saturday however, things did not turn out that way. My wife and I had planned on a little trip out in the country to find and photograph a particular barn I knew about. 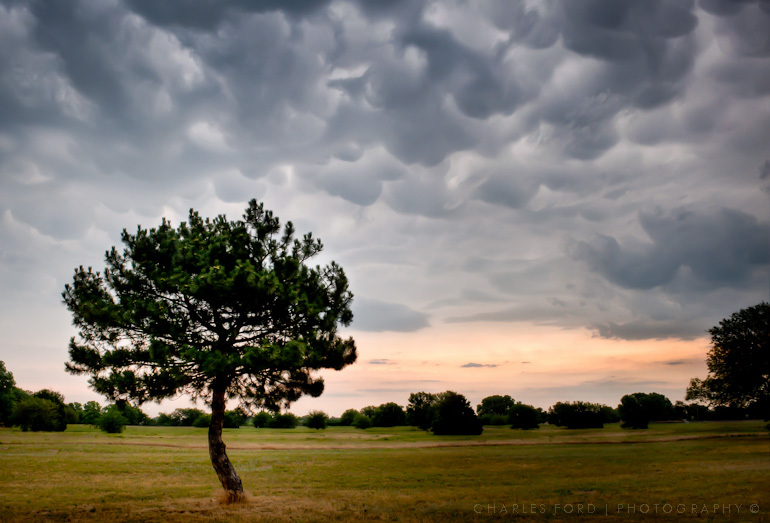 Severe thunderstorms developed west of Wichita however, and I decided the responsible thing to do would be to take a short drive out to the park where I often photograph, which is much closer to home than the planned barn trip. (Responsible is a relative term, I was running around with my tripod near a tall steel windmill, with lightning in the area.) The image above is from the park. Expecting to go home at that point, my wife surprised me by suggesting we drive west, out where we had seen some golden wheat fields earlier in the weekend. West would be driving into the storm, but I love a challenge. (Turns out she did not know the storms had been dropping tornadoes one county to the west.) We hit a couple more locations, on one I found myself under some gigantic power line towers. I must be an idiot. Anyhow, I will post more as the week goes by. No photographers, or their spouses, were hurt during this excursion. Vermont, in the fall, seems to hold a photo opportunity around every bend in the road. My wife and I were exploring one of the secondary roads in central Vermont, and it seemed like we could do no wrong. I must have stopped our rental car every five minutes or so, jumped out, grabbed a few quick frames, and moved on. We came around a curve, and I saw this beautiful white horse standing there…I mean come on…this is like shooting fish in a barrel! As most of you know who labor at photography know, it’s not usually quite so easy. Sometimes you get lucky though. I had waited about 20 minutes past the actual time of moonrise for it to rise high enough to become visible through distant clouds. Then there was no time to rest as the sky darkened, and the moon brightened. The image above is the result of a bracketed set of 5 exposures run through Photomatix. This is the best it could do with the rapidly expanding dynamic range of the scene- at least with what I gave the program to work with. I thought this had a rather atmospheric mood, although it is beginning to creep into the realm of the surreal. Alright, I confess it was this one that made my wife go “oooooh , That one!” when she saw it, so I figured I better post it. 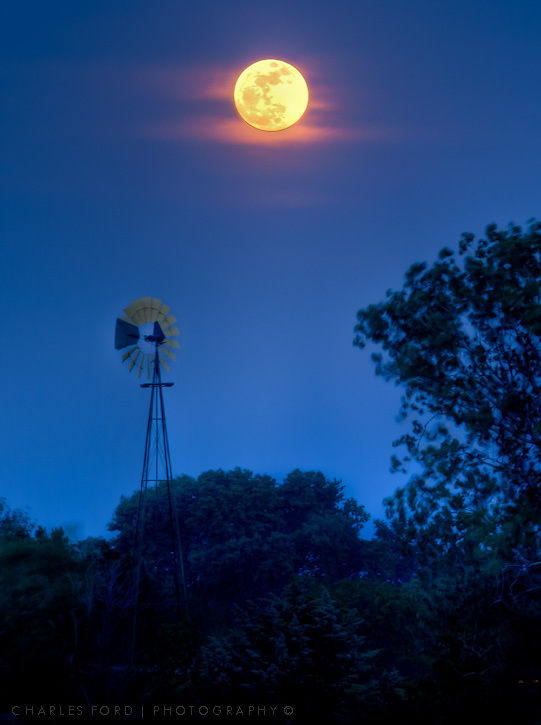 As you may have seen in the news, Saturday night’s full moon was extra special. Our moon’s orbit around the earth is somewhat elliptical, so it is closer to us at certain times. When those close approaches happen to coincide with the proper alignment with the sun for a full moon, we get a “supermoon”, which appears larger than at other times. 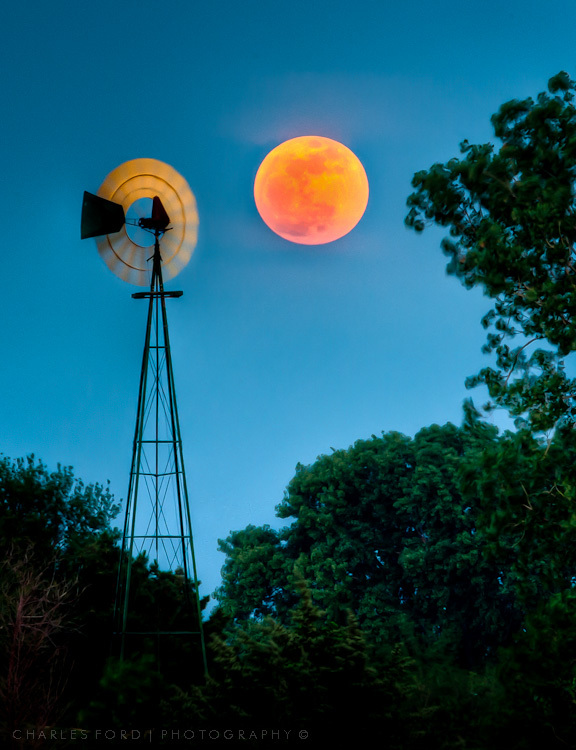 This windmill image was no accident, I used a fantastic app on my iPad called The Photographer’s Ephemeris. You can stick a pin in the app’s map and it will project lines to show you exactly where the sun and moon will rise and set on the horizon. I had a couple of ideas on where to position myself for Saturday’s moonrise, the app helped me know exactly where to be to get the image I had in mind. This app gets the Warped Prism seal of approval! Once the moon rose high enough to become visible through distant clouds and haze, there was a remarkably short time to work. This is an HDR image processed through Photomatix, then some tweaks in Lightroom. I have a small handful of ‘keepers’, but have found it really difficult to choose what to post.